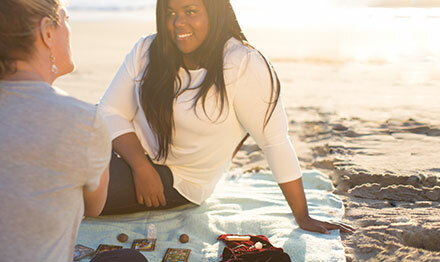 Only 2 out of 100 Psychics who apply to California Psychics are accepted. The process of becoming a psychic for California Psychics is not easy. The exacting application process alone is enough to deter all but the most gifted psychics from even applying. Our staff has developed a winning system for choosing, evaluating, and cultivating psychic excellence so that each advisor brings unmatched accuracy, experience and skill to each reading. After a rigorous telephone interview, applicants must then perform multiple test psychic readings with our highly trained professional psychic evaluators. A gifted psychic should be able to accurately identify past, present and future aspects of a client's life, as well as demonstrate their unique style personality and psychic abilities. All evaluations and a criminal background check must be passed in order to become a reader on our psychic hotline. Our gifted psychics undergo constant reevaluation. They need to maintain a high level performance and consistent psychic abilities to remain an advisor with California Psychics. No matter who you choose to confide in, you can be sure that they are at the top of their abilities and you're receiving the most experienced psychic guidance available. This could be the opportunity that you have been searching for! Are you are a gifted psychic who enjoys making a difference? Have you ever considered applying for a psychic job? We are always looking for qualified candidates who have natural ability, experience using their gift in the field, and are capable of delivering accurate and insightful psychic readings to our customers over the phone. Whether you’re looking for instant gratification or long-term benefits, our gifted psychic advisors can help you find your path to happiness, serenity, and success. Knows that there is more than one path to explore.